Superalloys, or High Temperature Alloys, are alloys that exhibit several key characteristics: excellent mechanical strength, resistance, thermal creep deformation, good surface stability and resistance to corrosion or oxidation. The term ‘superalloy’ was coined after World War II to describe alloys developed for use in turbine engines and turbo-superchargers that required high performance at elevated temperatures. The three major classes of superalloys are nickel-, iron-, and cobalt-based alloys. Since 1978, ASM has been supplying High Temperature Superalloys to the aerospace, and petroleum-chemical processing industries. For more information or to receive a prompt superalloy price quote, please contact us at 800 398-4345, 954-977-0666 or submit the Request Information form on the right side of this page. These materials are designed to provide unique strength and/or corrosion properties at elevated temperatures. Major attributes include properties such as high strength, high creep resistance, resistance to softening, or resistance to metals loss at high temperature from oxidation, sulfidation, or carburization. Nickel content ranges from approximately 25% to 60%, with critical amounts of chromium, molybdenum, columbium and titanium. AL 625 HP Applications similar to AL 625 where extended fatigue life is desired, particularly at low cycle. Pollution control and Radioactive waste equipment, Chemical transportation and acid production equipment, Pickling equipment, Oil/Gas well piping. Soft Magnetic - Controlled Expansion - The thermal expansion characteristics of this group are used in several ways. For glass-to-metal sealing applications, the thermal expansion characteristics of glass and metal are closely matched and the metal must also have an oxide which fluxes at high temperature with the glass to provide a hermetic and mechanically sound joint. The most common applications are attachment of metallic parts to the internal of TV and cathode ray tubes, and also certain lamp bulb bases. Controlled Expansion: Liquefied gas storage, Bimetallic strips for thermometers, LNG, TV Aperature masks, Composite wing molds. Controlled Expansion: Lead frames, Color TB electron guns, Glass-metal and ceramic-metal seals, Transistors. For more information about Nickel Alloys, please visit the Nickel Development Institute website at www.nidi.org. Nickel-based Superalloys have been developed for very high temperature applications where relatively high stresses are encountered and where high surface stability is frequently required. Nickel is a very versatile metal with many applications in the aerospace industry. 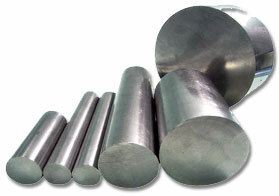 It's ability to alloy with a wide range of metals has brought it to the forefront of metallurgy. Nickel alloys possess high strength and excellent corrosion resistance, particularly in aerospace applications where elevated temperatures are present. Cobalt is a strategic and critical metal used in many diverse commercial, industrial, and military applications. The largest use of cobalt in the aerospace industry is to make parts for gas turbine aircraft engines. Heat resistant alloys of nickel and cobalt are used where high temperature performance, particularly creep resistance, is required. These alloys have been typically selected for gas turbine components such as blades, turbine wheels and latter stage compressor disks, which are subjected to long term rotational stresses and high temperatures.